A jury looks closely at the evidence… So do we. 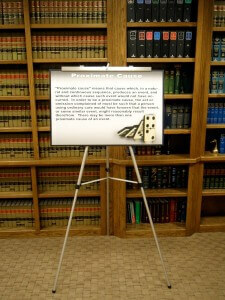 Substandard materials, sloppy mounting techniques and low resolution images don’t cut it in court. But that’s exactly what you’ll get from a lot of other so-called litigation support companies that use third-party vendors to make your trial exhibits. Yes! We do trial boards. Better than anyone else! Litigation is full of deadlines, headaches and demanding client expectations, especially at the time of Trial. The team at CopyScan Technologies understands trials are won or lost based on how well attorneys pay attention to the details — especially when it comes to quality trial graphics. You and your practice know that using high quality trial exhibits is one of the most powerful tools in your courtroom arsenal. So do we. Why put your trust in a trial graphics vendor who doesn’t understand the unique pressure you’re under to deliver results right away? With more than two decades of exhibit production excellence, CopyScan Technologies has long-term relationships with many top Law Firms, Corporate Legal Departments and Trial Consulting Experts in South Florida — and across the nation. Law firms call on us time and again because they know CopyScan Technologies delivers top-quality, winning results with every job – large or small. We employ the best technology in our secure, HIPAA-Compliant 24/7 facility, staffed by some of the highest trained and certified document technicians anywhere. At CopyScan Technologies, you can count on compelling visuals, quality trial graphics and the very best customer service experience in the litigation services industry.